1.Porcelain Veneers—Extremely thin shells that are usually attached to the upper front teeth. 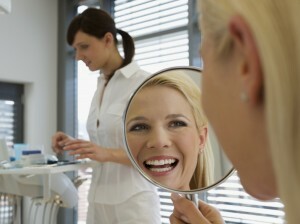 These resolve the unsightly appearance of teeth that are chipped, cracked, oddly shaped, mildly rotated or misaligned. They can also cover over spaces or gaps between teeth, resulting in a dazzling smile. 2.Teeth Whitening—An economic option that addresses smile deficiencies caused by teeth that are yellowed, stained or discolored. Teeth color can be brightened by multiple shades, and years can be taken off the look of your teeth in as little as one visit to Dr. Horn or Dr. Loween. 3.Bonding—Highly effective in addressing the same smile issues as porcelain veneers, utilizing a composite resin that is applied to teeth, sculpted and polished to have the same color and appearance as natural teeth. This treatment method is non-invasive and can also be completed in a single dental visit. The only thing better than a healthy mouth, is a healthy mouth that garners positive attention with its sparkle. Call today to see how our cosmetic dentistry services for Minneapolis area residents can boost the appearance of your smile in as little as one visit to Serene Oaks Dental.